January 2019: Beckett, the only female from our 2018 litter, surprised myself and her co-breeder/owner Jennifer Beach-Buda with a BOB win over specials as an 8 month old! Beckett is Rusalka Everlong Influencer and is sired by GCH MBISS Plumcreek I’m A New Yorker and out of our CH Rusalka What A Rush. Beckett resides with Jennifer at Rusalka Whippets in Iowa. Sookie finishes her championship earning her final point at the Burlington Kennel Club show in Elkhorn, WI under judge Marjorie Martorella. 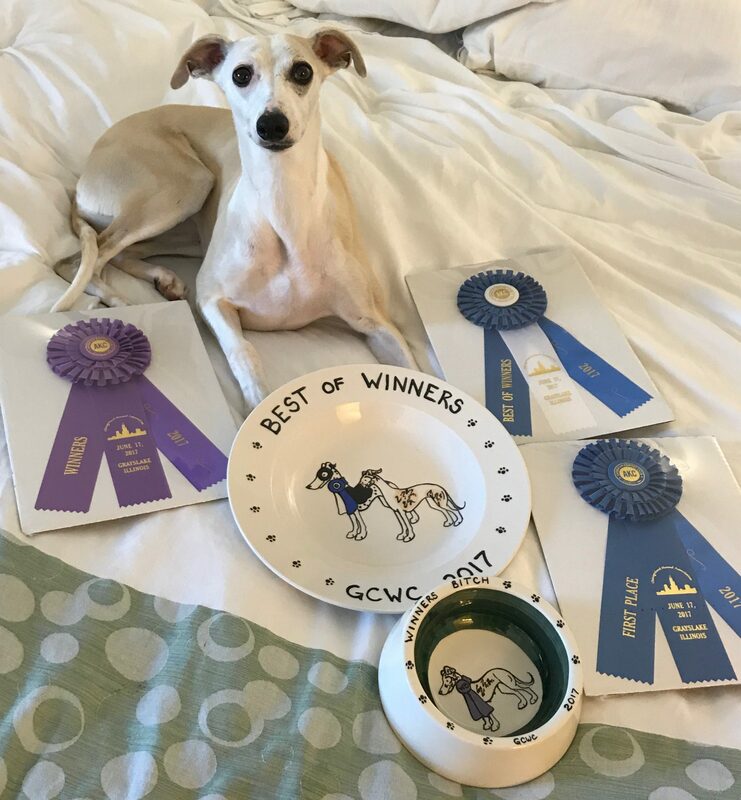 June 2017: Sookie wins her second major and BOW during the Chicagoland shows under judge Kalen Dumke. Nova wins ANOTHER major to not only finish her championship, but she went on to be awarded BOS under respected judge Cindy Scott in Amana, Iowa. June 2016: Nova earns a 4 point major in Chicago during the AWC Supported Entry weekend under judge Betty Anne Stenmark. May 2016: Sookie wins a major and BOS in St. Peter, MN on a very rainy day! August 2015: Nova is awarded WB for a 5 point major under judge Raymond Yurik during the Northcentral Specialty weekend. April 2015: Sookie places 3rd in her class at the AWC National Specialty Show with some tough competition. Our first National was a great experience! January 2015: Nova wins BIG at her first show! At 6 months of age she was awarded BOB and a Group 4 Placement under Judge Gary Doerge in Oshkosh, WI.